NO PURCHASE NECESSARY TO ENTER OR CLAIM PRIZE. A PURCHASE WILL NOT INCREASE YOUR CHANCES OF WINNING. VOID WHERE PROHIBITED. 1. Eligibility: The Snarf’s Sandwiches “Top Snarf” Contest (the “Contest”) is open only to legal residents of the fifty (50) United States and the District of Columbia who are at least eighteen (18) years of age or older at the time of entry. Void where prohibited by law. Employees, officers, and representatives of Snarf’s Sandwiches (“Sponsor”), and any of its subsidiaries, affiliates, parent company, distributors, divisions and agencies, and their immediate families (spouse, parents, siblings and children, including “step” of any of the foregoing) and individuals living in the same household with such employees, officers, and representatives are not eligible to participate or win. The Contest is subject to all applicable federal, state and local laws and regulations. Participation in the Contest constitutes entrant’s full and unconditional agreement to these Official Rules and Sponsor’s decisions, which are final and binding in all matters related to the Contest. Winning a prize is contingent upon fulfilling all requirements set forth herein. Entries must be received in the manner described in these Official Rules during the Contest Period to be eligible for prizes. Limit three entries per person. 2. Sponsor: Snarf’s Sandwiches with principal place of business at 2762 Walnut Street Denver, CO 80205. 3. Timing: Contest begins Tuesday, January 1, 2019 at 12:01:00 a.m. [CDST] and ends Friday, February 15, 2019 at 11:59:59 p.m. [CDST] (the “Contest Period”). All dates are subject to change. Sponsor’s computer is the official time keeping device for the Contest. 4. How to Enter for a Chance to Win: NO PURCHASE NECESSARY TO ENTER OR WIN. Visit www.topsnarf.com and follow the instructions by entering your first name, last name, email address, and sandwich recipe ingredients and other descriptive details via the Contest entry form. All online entries must be received by Friday, February 15, 2019 at 11:59:59 p.m. [CDST]. Limit three (3) entry per person. Multiple entries by any single entrant, under varying identities or via different email accounts, or submission of an entrant that is not a real and natural person will disqualify all entries for that entrant. Entrants assume all risk of late, misdirected, incomplete, or incorrect or mistaken entries. In case of dispute, the authorized account subscriber of the email account used to enter the Contest at the actual time of entry will be deemed the participant, and must comply with these Official Rules. The authorized account subscriber is deemed to be the natural person who is assigned an email address by an ISP, online service provider, or other organization, which is responsible for assigning email addresses. Limit one (1) winner per household. Entry Guidelines: The Entry submitted by you must not infringe on any third party’s trademark or other intellectual property rights, as determined by Sponsor in its sole discretion. Entries shall not defame, misrepresent or contain disparaging remarks about Sponsor or any of its products, or other people, products or companies or communicate messages inconsistent with the positive images and/or goodwill to which Sponsor associates in Sponsor’s sole discretion. Entries shall not contain any content that is or contains: unlawful behavior, profanity, explicit sexuality, harmful, threatening, abusive, harassing, tortious, defamatory, vulgar, obscene, libelous, or is hatefully, racially, ethnically or otherwise offensive or objectionable. Entries must not contain materials embodying the names, likenesses, photographs, or other identifying elements of any person, including, without limitation, celebrities and/or other public or private figures, living or dead, without express written permission from the person or persons (or their estate) depicted in the Entry. Sponsor reserves the right to monitor or screen entries, in its sole discretion. Sponsor has no obligation to use or post any Entry you submit. Sponsor shall have full right and power to copy, publish, broadcast, display, distribute, use, edit, translate, alter, combine with other material, reuse, adapt and/or commercialize any or all portions of the Entries in any way and for any purpose whatsoever, at any time, now or in the future, in any media now known or hereafter devised throughout the world. In Sponsor’s sole discretion, entries that are not compliant with the guidelines stated herein or are not received during the Contest Entry Period will be ineligible. By submitting an Entry you warrant and represent that it: (a) is your original work; (b) has not been previously published; (c) has not received previous awards; (d) does not infringe upon the copyrights, trademarks, rights of privacy, publicity or other intellectual property or other rights of any person or entity; and (e) that publication of the entry via various media including web posting, will not infringe on the rights of any third party. You will indemnify and hold harmless Sponsor and Promotion Entities from any claims to the contrary. a. 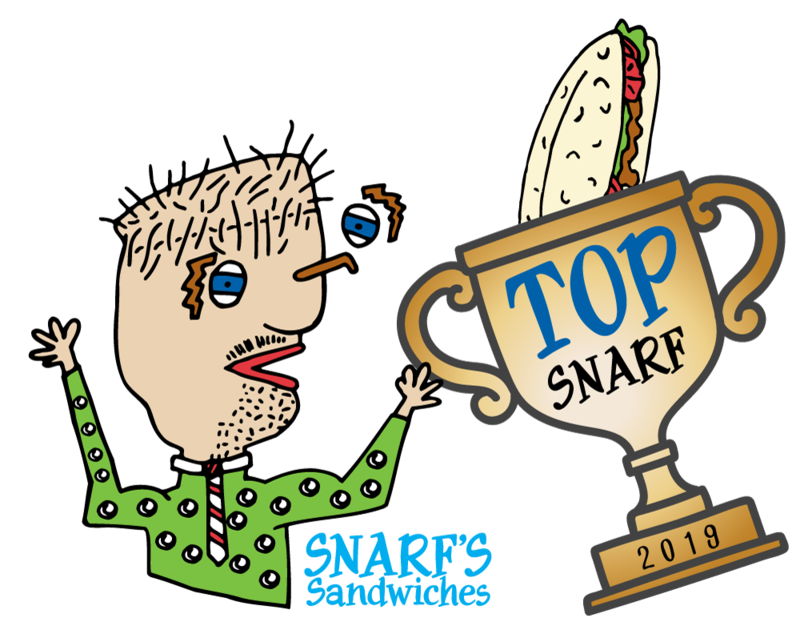 On or before Thursday, February 28, 2019, five (5) finalists will be selected from among all qualifying entries to attend the “Top Snarf” taste test event in early March 2019 at a local Snarf’s Sandwiches location. Finalists must attend the taste test event to be eligible to win the Grand Prize. The winning recipe will be selected by a judging panel, to include Jimmy (aka “Snarf”). Judging Criteria: The panel will judge finalists’ entries based on: Creativity and Originality, Visual Appeal, and Overall Taste. The decisions of the judges are final and binding in all respects. b. The winner selected will be notified by email within five (5) days of the drawing. Potential winners shall comply with all response requirements set forth in the notification. If any potential winner is found to be ineligible, or if he or she has not complied with these Official Rules or declines a prize for any reason prior to it being awarded, such potential winner will be disqualified and an alternate winner will be selected. Sponsor shall have no liability for any potential winner notification that is not received by any potential winner for any reason, including but not limited to lost, late or misdirected mail. In the event that a potential winner of any prize is disqualified for any reason, Sponsor will award the applicable prize to an alternate winner by random drawing. There will be three (3) alternate drawings after which the prize will remain un-awarded. c. ALL POTENTIAL WINNING ENTRIES FOR EACH PRIZE ARE SUBJECT TO VERIFICATION BY SPONSOR, WHOSE DECISIONS ARE FINAL AND BINDING. IF SPONSOR SO ELECTS, A POTENTIAL PRIZE WINNER AND HIS/HER PARENT/LEGAL GUARDIAN MAY BE REQUIRED TO SUBMIT TO A CONFIDENTIAL BACKGROUND CHECK TO CONFIRM ELIGIBILITY AND HELP ENSURE THAT THE USE OF ANY SUCH PERSON IN ADVERTISING OR PUBLICITY FOR THE CONTEST WILL NOT BRING SPONSOR INTO PUBLIC DISREPUTE, CONTEMPT, SCANDAL, OR RIDICULE OR REFLECT UNFAVORABLY ON THE CONTEST AS DETERMINED BY SPONSOR IN ITS SOLE DISCRETION. POTENTIAL WINNERS SHALL RESPOND TO ALL SUCH REQUESTS WITHIN FORTY-EIGHT (48) HOURS. AN ENTRANT IS NOT A WINNER OF ANY PRIZE, EVEN IF THE CONTEST SHOULD SO INDICATE, UNLESS AND UNTIL ENTRANT’S ELIGIBILITY AND THE POTENTIAL WINNING ENTRY HAS BEEN VERIFIED AND ENTRANT HAS BEEN NOTIFIED THAT VERIFICATION IS COMPLETE. d. All selected potential winners must comply with all the terms and conditions of these Official Rules and winning is contingent upon fulfilling all requirements. It is the entrant’s responsibility to ensure that he/she has complied with the conditions contained in these Official Rules. The selection of qualified winners is final and binding in all matters related to the Contest. Contest winners must continue to comply with all terms and conditions of these Official Rules, and winning is contingent upon fulfilling all requirements. Winner will receive prize approximately 8 to 10 weeks after the conclusion of the Contest. A winner may not transfer his or her prize unless authorized in writing by Sponsor before the transfer is made. Such authorization may be granted or withheld in Sponsor’s sole discretion. Requests for transfer must be in writing. The person to whom the prize is transferred must meet the eligibility restrictions set forth in these Official Rules. 7. For All Prizes: No cash or other substitution, assignment or transfer of any prizes is permitted, except by Sponsor, who reserves the right to substitute a prize or prize component with cash or another prize of comparable or greater value. By accepting the prize, each winner (or parent/legal guardian if winner is a minor in his/her state of residence) acknowledges that he or she meets the eligibility requirement of the Contest and is responsible for all federal, state and local taxes, surcharges, service charges, processing and handling fees, and all other costs and expenses incurred in claiming the prize. Prizes will be awarded “as is” with no warranty or guarantee, either express or implied offered by Sponsor. 8. Publicity: Except where prohibited, participation in the Contest and acceptance of a prize constitutes winner’s consent to Sponsor’s use of winner’s name, likeness, photograph, voice, opinions, biographical information, hometown, and state for promotional purposes in any media without further payment or consideration. By accepting a prize the winner, on behalf of himself/herself and child, parent/legal guardian of a winner agrees that Sponsor and its franchisees, affiliates, subsidiaries, and their respective officers, directors, employees, representatives and agents shall not be responsible or liable for any loss, damage or injury of any kind resulting from participation in the Contest or from acceptance, delivery, receipt, possession and or use or misuse of any prize. 9. General Conditions: All federal, state and local laws and regulations apply. Sponsor reserves the right to cancel or modify the Contest if fraud, technical failures, or any other factor beyond Sponsor’s reasonable control impairs the integrity of the Contest, as determined by Sponsor in its sole discretion. In such event, Sponsor reserves the right to award the prizes at random from among the eligible entries received up to the time of the impairment. Sponsor reserves the right in its sole discretion to disqualify any individual it finds to be tampering with the entry process or the operation of the Contest or to be acting in violation of these Official Rules, or in an unsportsmanlike or disruptive manner. Any attempt by any person to deliberately damage any web site or undermine the legitimate operation of the Contest is a violation of criminal and civil law, and should such an attempt be made, Sponsor reserves the right to seek damages from any such person to the fullest extent permitted by law. Sponsor’s failure to enforce any term of these Official Rules shall not constitute a waiver of that provision. 10. RELEASE: BY ENTERING THIS CONTEST, ENTRANT AGREES TO RELEASE AND HOLD HARMLESS SPONSOR AND ANY PROMOTIONAL PARTNERS, EACH OF THEIR PARENT, SUBSIDIARY, AFFILIATE AND RELATED COMPANIES, AND EACH OF ITS AND THEIR RESPECTIVE OFFICERS, DIRECTORS, EMPLOYEES, AND AGENTS (COLLECTIVELY THE “RELEASED PARTIES”) FROM AND AGAINST ALL LOSSES, DAMAGES, RIGHTS, CLAIMS OR CAUSES OF ACTION OF ANY KIND ARISING, IN WHOLE OR IN PART, DIRECTLY OR INDIRECTLY, OUT OF PARTICIPATION IN THE CONTEST OR RESULTING DIRECTLY OR INDIRECTLY, FROM ACCEPTANCE, POSSESSION, USE, OR MISUSE OF ANY PRIZE AWARDED IN CONNECTION WITH THE CONTEST, INCLUDING WITHOUT LIMITATION PERSONAL INJURY, DEATH, AND/OR PROPERTY LOSS OR DAMAGE, AS WELL AS CLAIMS BASED ON PUBLICITY RIGHTS, DEFAMATION, AND/OR INVASION OF PRIVACY. 11. Limitations of Liability: The Released Parties are not responsible for: (1) any incorrect or inaccurate information, whether caused by entrants, printing errors, or by any of the equipment or programming associated with or utilized in the Contest; (2) technical failures of any kind, including, but not limited to malfunctions, interruptions, or disconnections in phone lines or network hardware or software, lost or unavailable network, server, Internet Service Provider (ISP), website, or other connections, availability or accessibility or miscommunications or failed computer, satellite, telephone, or cable transmissions; (3) unauthorized human intervention in any part of the entry process or the Contest; (4) technical or human error which may occur in the administration of the Contest or the processing of entries; or (5) any injury or damage to persons or property which may be caused, directly or indirectly, in whole or in part, from entrant’s participation in the Contest or receipt or use of any prize or while traveling to or from any prize-related activity. If for any reason an entrant’s entry is confirmed to have been erroneously deleted, lost, or otherwise destroyed or corrupted, entrant’s sole remedy is another entry in the Contest, provided that the Contest is still open. 12. Disputes: Entrant agrees that: (i) any and all disputes, claims and causes of action arising out of or connected with this Contest, or any prizes awarded, other than the administration of the Contest or the determination of winners, shall be resolved individually, without resort to any form of class action, and in accordance with the laws of the State of Colorado without regard to its principles of conflicts of law. Jurisdiction and venue shall be solely within the State of Colorado; (ii) subject to any other limitation in these Official Rules, any and all claims, judgments and awards shall be limited to actual out-of-pocket costs incurred, including costs associated with entering this Contest but in no event attorneys’ fees; and (iii) under no circumstances will entrant be permitted to obtain awards for and entrant hereby waives all rights to claim punitive, incidental, and consequential damages and any other damages, other than for actual out-of-pocket expenses, and any and all rights to have damages multiplied or otherwise increased. SOME JURISDICTIONS DO NOT ALLOW THE LIMITATIONS OR EXCLUSION OF LIABILITY FOR INCIDENTAL OR CONSEQUENTIAL DAMAGES, SO THE ABOVE MAY NOT APPLY TO YOU. ALL ISSUES AND QUESTIONS CONCERNING THE CONSTRUCTION, VALIDITY, INTERPRETATION AND ENFORCEABILITY OF THESE OFFICIAL RULES, OR THE RIGHTS AND OBLIGATIONS OF THE ENTRANT AND SPONSOR IN CONNECTION WITH THE CONTEST, SHALL BE GOVERNED BY AND CONSTRUED IN ACCORDANCE WITH THE LAWS OF THE STATE OF COLORADO, WITHOUT GIVING EFFECT TO ANY CHOICE OF LAW OR CONFLICT OF LAW RULES (WHETHER OF THE STATE OF COLORADO OR ANY OTHER JURISDICTION), WHICH WOULD CAUSE THE APPLICATION OF THE LAWS OF ANY JURISDICTION OTHER THAN THE STATE OF COLORADO. 13. Winners List: For the names of winner, mail a self-addressed, stamped envelope to Snarf’s Sandwiches “Top Snarf” Contest Winners List, 2762 Walnut Street, Denver, CO 80205. Vermont residents, omit requirement of return postage. Only one request per outer envelope. Names of winners will be available after May 1, 2019. © 2019 Snarf’s Sandwiches. All rights reserved.